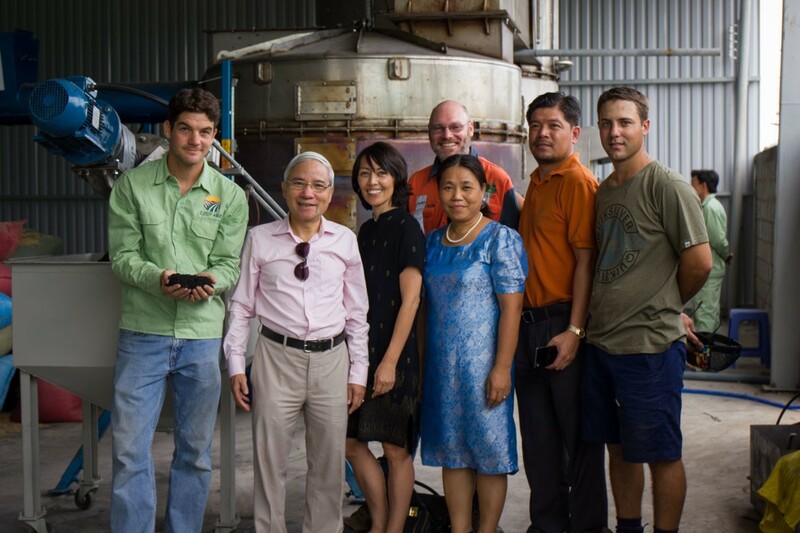 Biochar Production Technology Lands in Vietnam. 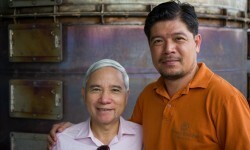 Dr. Nguyen Huu Ninh (left), and Mr. Nguyen Hong Quang. 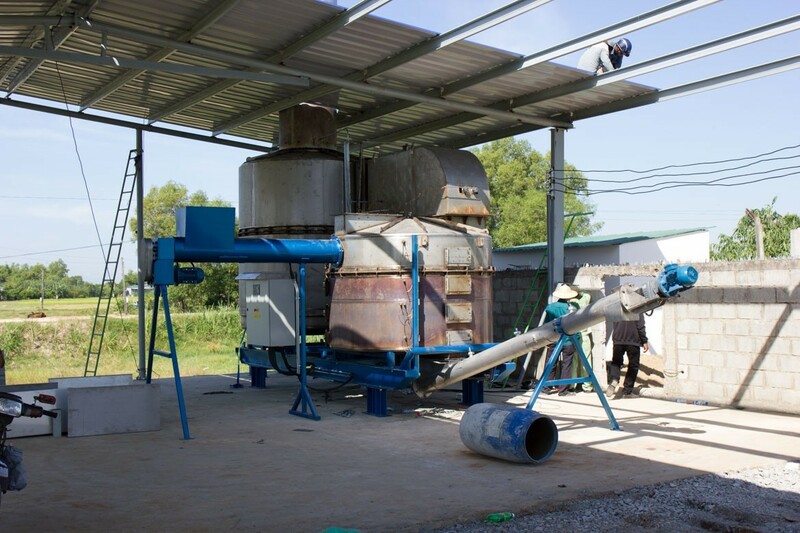 In November, 2014 I had the honor of assisting in the installation of a BiGchar 2200 model biochar production technology at a new EcoFarm corn and rice processing facility near Ho Chi Min City, Vietnam. The facility is well suited for biochar and heat production, and part of a host of other interesting projects. 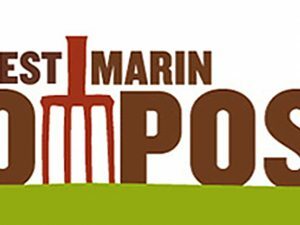 I had been engaged with Ecological Farming Corporation (EcoFarm) as technical advisor in a project partially funded by a grant awarded by the Vietnam Business Challenge Fund. More details on this can be found in a previous post HERE. In summary, two men joined together to develop “climate-smart” agricultural projects; Mr. Quang, a successful and self-made businessman, and Dr. Ninh, a professor and Nobel Laureate for his contribution to the 2007 International Panel on Climate Change report. They travelled to Hawaii in 2013, met with me, we signed a memorandum of understanding, a grant was awarded, a technology was chosen, purchased, shipped, installed and is now in operation. 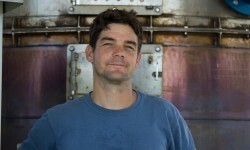 Josiah Hunt, Technical Advisor for the EcoFarm biochar production technology procurement and installation project. 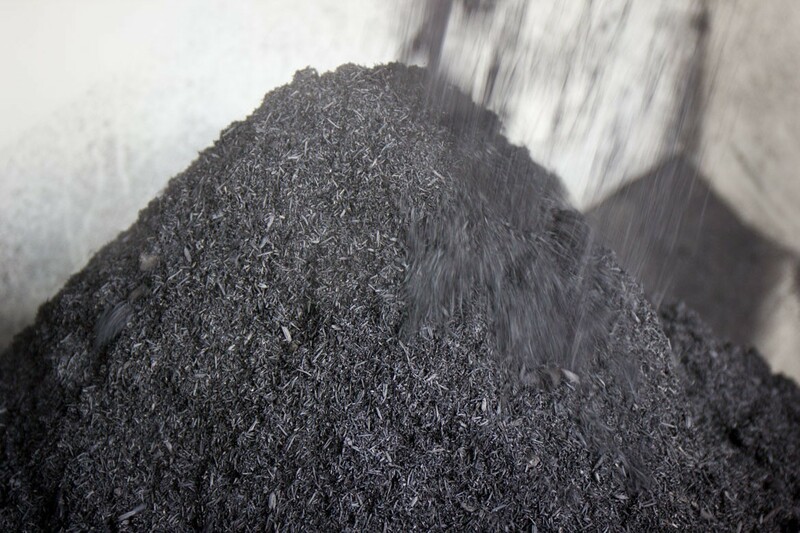 Among the three technology options that provided quotes for the project, the BiGchar 2200 biochar production technology was chosen for it’s continuous feedstock throughput, acceptance of a wide range of feedstock materials, biochar quality, opportunity for heat capture, and capacity vs. price. More information on that technology and can be found HERE. 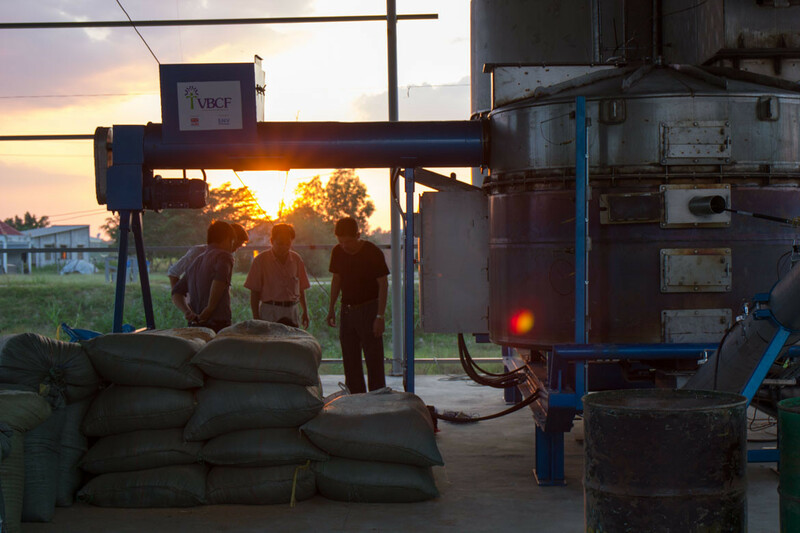 The EcoFarm corn and rice processing facility where the machine landed was a perfect fit for biochar production. 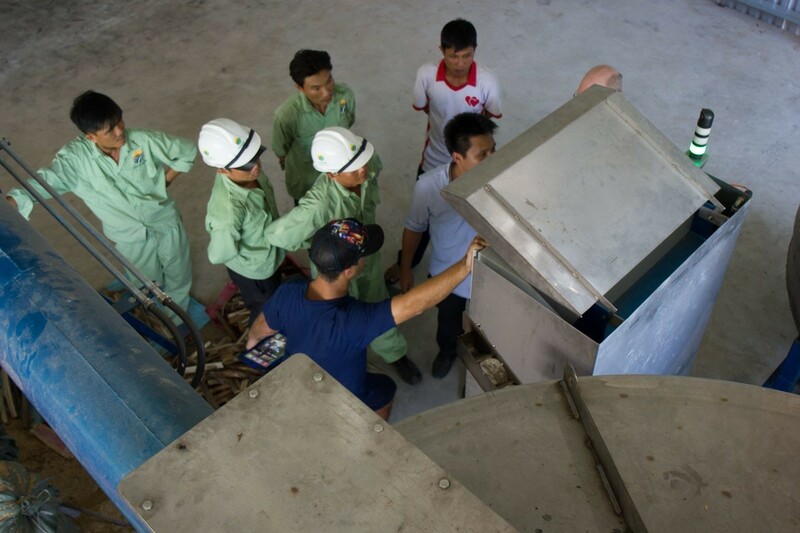 The corn cobs and rice hulls that accumulate when processing the field material into storable grain will now be used to create the heat needed for drying the grains before storage. The biochar produced will be used in their own organic fertilizer blends and applied back to the fields. It arrived in one 40′ container. The core of the technology was more or less fully assembled on the second day. Here it is on the third morning. Most notably missing is the accessory materials handling equipment. For basic commissioning it was fed by hand. You may notice in the coming pictures that the walls and roof are installed around the machine and some preliminary materials handling equipment begins to appear. Mr. Quang’s efforts have been gathering lots of attention lately. A local documentary film crew showed up on site one day. A few months previous, the EcoFarm project was one of the featured articles in Forbes Magazine Vietnam, earning a three page spread. As the sun went down that day, we fired it up for the first time. It ran like a champ. Rice hull biochar. It has a really nice texture. For roughly half the year the processing facility will be handling corn, at which time corn cobs and husks will be the primary feedstock (also makes great biochar). After our first meeting in Hawaii. 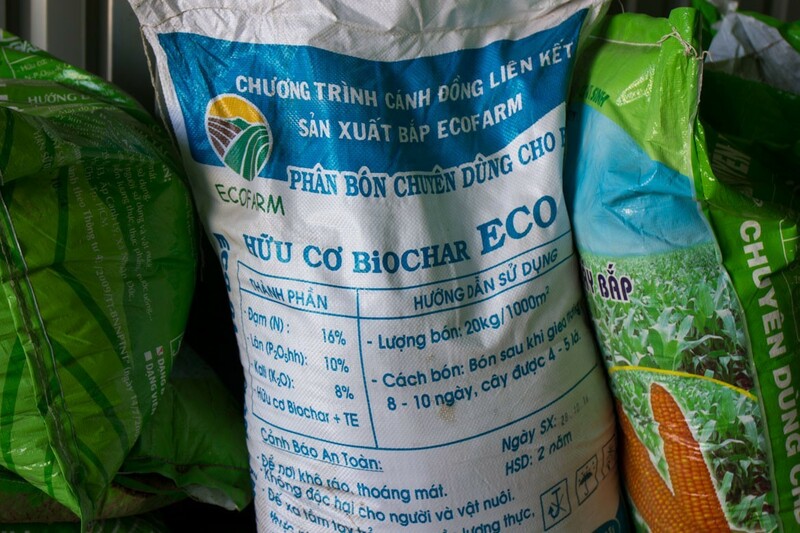 Mr. Quang had his staff at EcoFarm incorporate biochar into the fertilizer blends for their fields. They have been observing great success with the products and are happy to be able to expand production with their newly installed technology. A small pile of biochar in the foreground. Stacked bags of biochar (red) and sawdust (green) in the background. 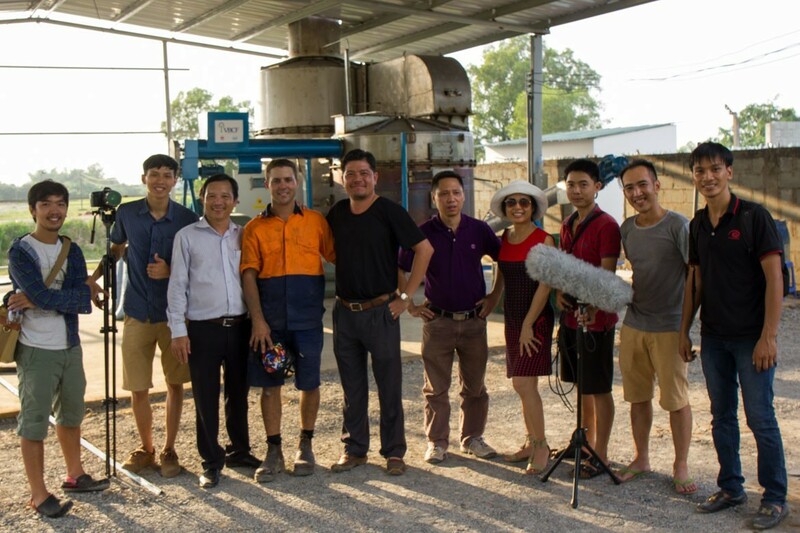 After months of planning, the technicians on the ground at EcoFarm were pretty keen to “play with their new toy” and see some biochar produced. It was quite gratifying for all once we got started. James Joyce (lead engineer), and Shawn McCann (design engineer), teach the EcoFarm staff how to navigate the PLC control panel with the translation help of Nguyen Hai My. This is the PLC control panel. The cylinder on the right shows the hearth temps. The cylinder on the left represents the thermal oxidizer (emissions control / furnace). Notice that the measured temperatures are different throughout. 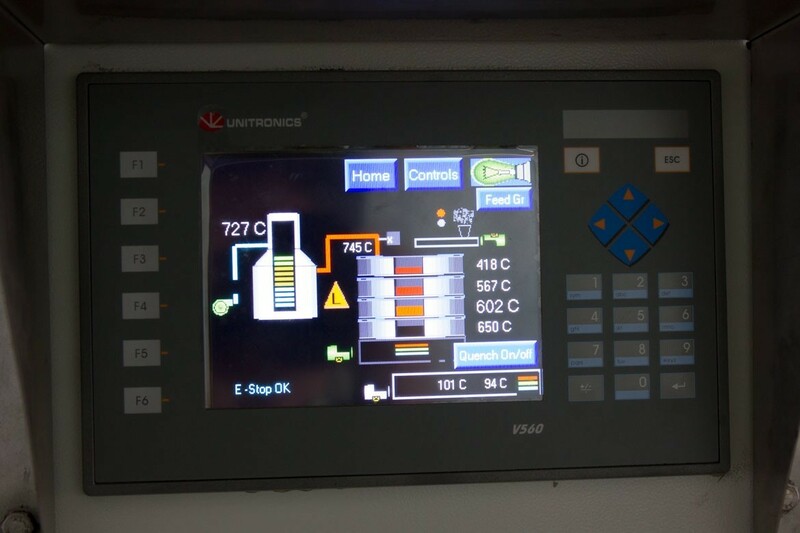 With this PLC and the related software, machine operation can be almost fully automatic. Software was developed to manage the intake feed, rake speed, and other parameters that influence temperature. There is a manual control box as well for operator preference and safety. After a few days of start-ups and practice runs, the machine was fully operated by the EcoFarm staff without assistance. From left to right, Josiah Hunt, Dr. Nguyen Ninh, Bernice Bowers (US relations director), Mrs. Ninh, James Joyce, Nguyen Hong Quang, Shawn McCann. From 3 different countries, Vietnam, US, and Australia, we represented a truly international effort. 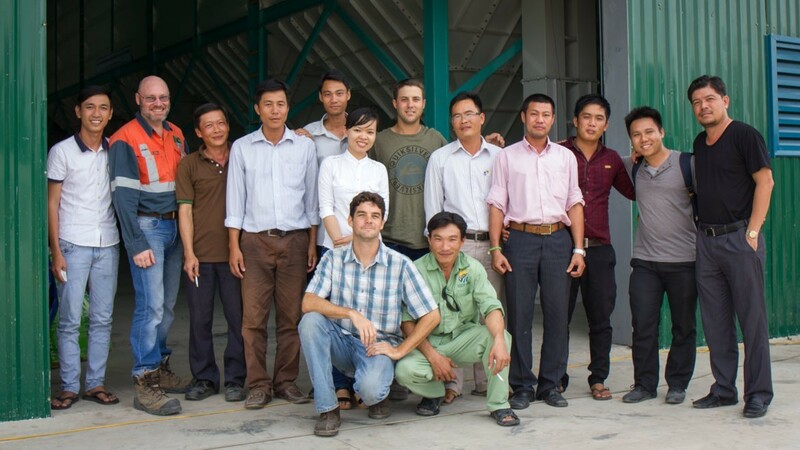 The staff at Ecological Farming Corporation’s corn and rice processing facility, in Long An province, in the greater Mekong Delta, Vietnam. EcoFarm provides seeds, fertilizer, and harvesting technology to their growers, and guarantees prices for grain. The farmers that have joined are seeing larger yields and larger profits in EcoFarms climate smart farmer collaborative model. 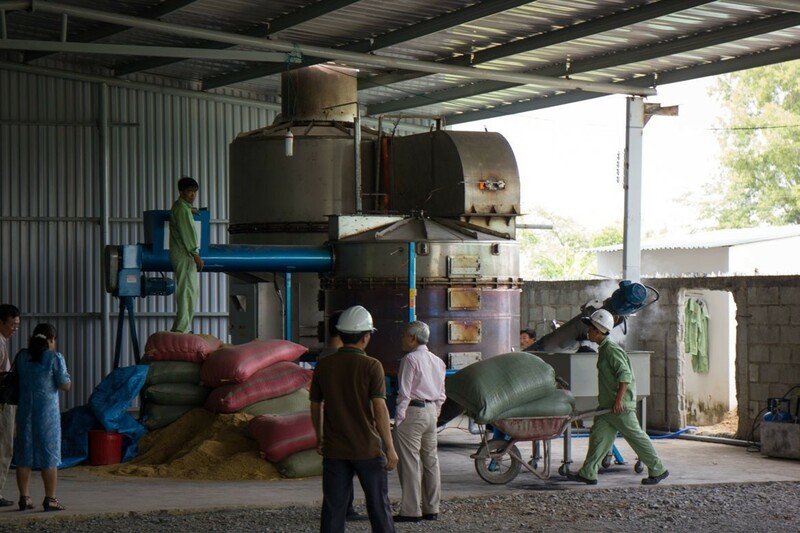 Rice hull biochar as it comes out of the machine. 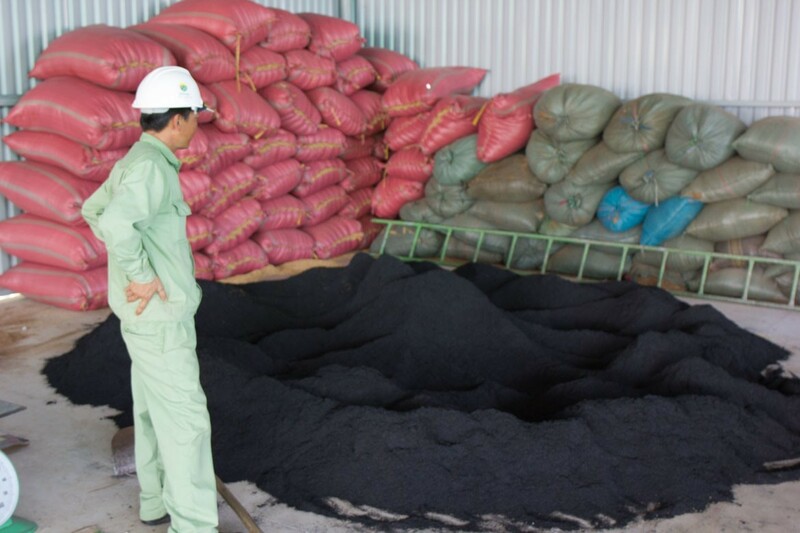 This material is destined for blending with other organic materials and beneficial microbes in the creation of EcoFarm fertilizer blends to be used in the fields that grow the crops which will end up right back at the processing facility, and the pattern repeats. 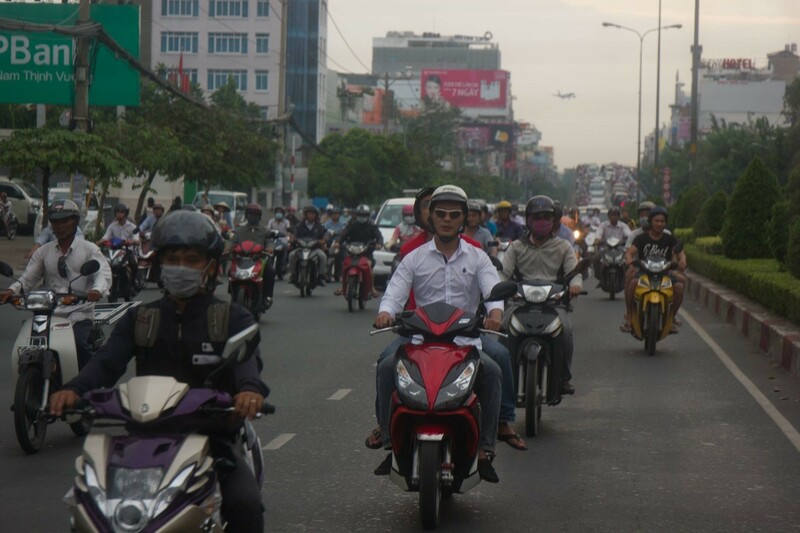 Vietnam is one of the fastest growing economies in Asia. They also hold the distinction of being one of the worlds most susceptible countries to the negative affects of Climate Change. Increased intensity and frequency of droughts, floods, cyclone, and the threats of sea-level rise have already been noted. (Nguyen Huu Ninh, Environmental Policies in Asia, World Scientific, 2014). The poverty level has decreased from 58.1 percent in 1993 to only 10.7 percent in 2010. This has afforded many of it’s citizens to consumption of the very luxuries that are directly linked to the causes of Climate Change. This reality is not lost on Vietnam. Technologies and opportunities that can provide society the ability to evolve, without the environmental costs that rob us of a future are highly sought after. Citizens such as Mr. Quang and Dr. Ninh are cherished locally for their work and the promise it holds. 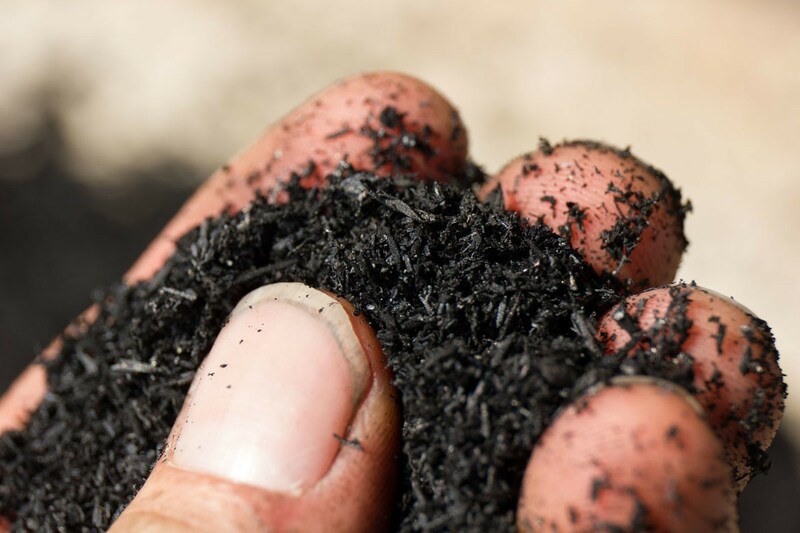 Technologies such as the BiGchar, and the biochar amended fertilizers produced, are recognized as pathways towards future abundance. 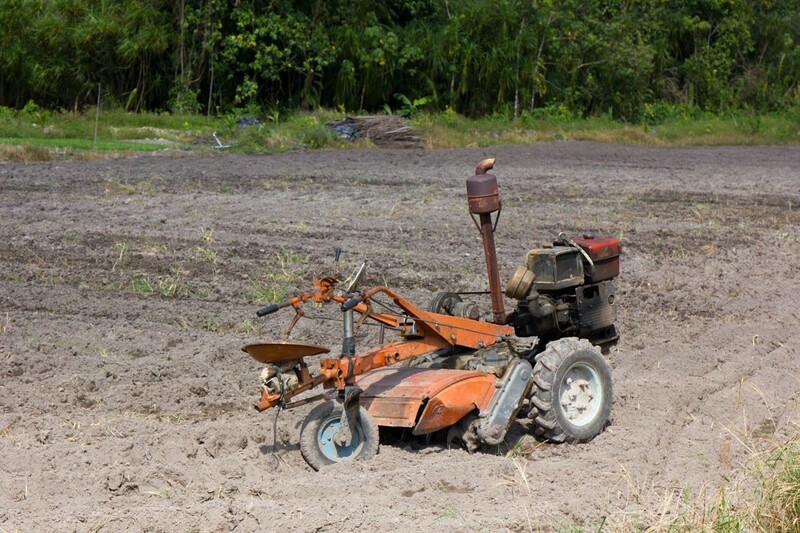 A freshly plowed field at the EcoFarm site on Phu Quoc island. This island has seen explosive growth as a tourist destination. 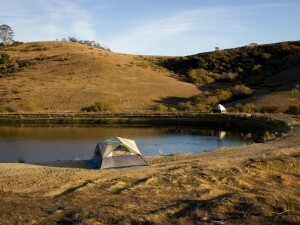 The EcoFarm site here provides food safety certified fresh produce for the visitors. Abundant in fish but poor in produce, the island’s hotels were 100% dependent on shipments of vegetables from the mainland, which often left them without fresh produce until EcoFarm established production here a few years ago. 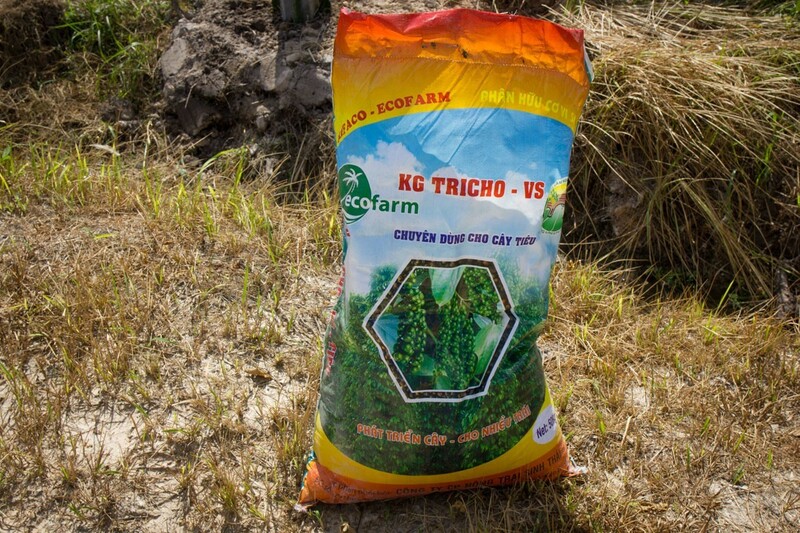 Lacking options in high quality, organic based fertilizers, EcoFarm produces their own. Here is a version that is specifically for their organic certified black pepper. 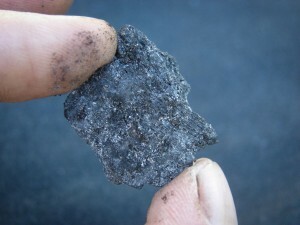 The fertilizer blend already contains a small amount of biochar produced in rudimentary fashion. The new facility in Long An will allow them to expand. 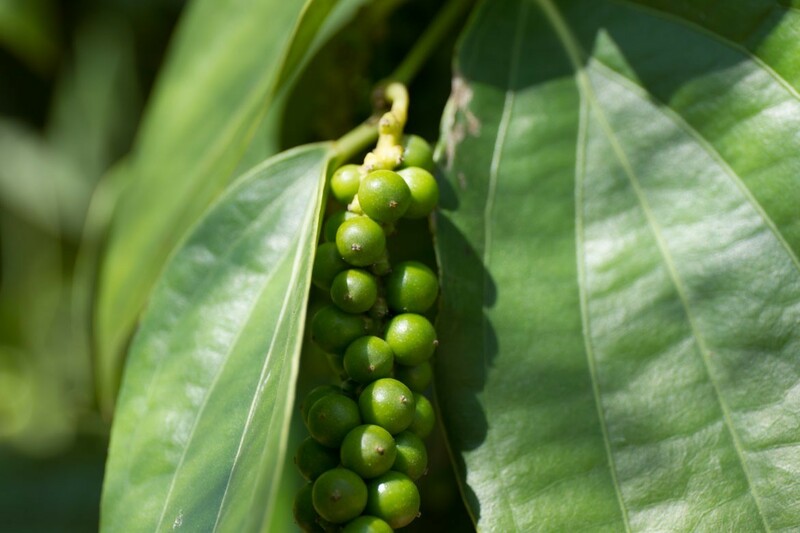 Certified organic black pepper production at the Phu Quoc farm site. EcoFarm is already working on acquiring several more BiGchar units. A few stationary units such as the 2200 model shown here, and a series of smaller mobile units that can be deployed to the individual farms which are typically one hectare or less. 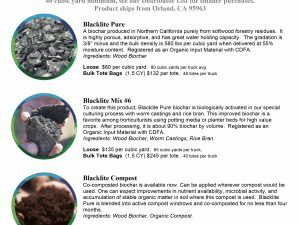 If you are interested to learn more about the BiGchar biochar production technology, more information can be found HERE.